The type of letters is significantly different from typographical font. 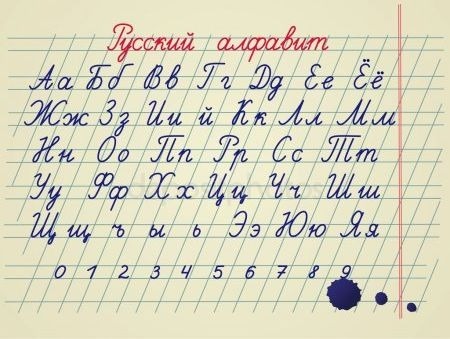 Russian printed italic font developed under the handwriting. The letter is carried out with a slope slants of the letters, while the letters in the words are interconnected. The style of uppercase and lowercase letters is different. There are no capital letters for the letters ъ, ы, ь, since these letters are almost never found at the beginning of a word, and it is not customary to highlight spelling words by all capital letters (as sometimes happens in typographical font). In Russia, italics is studied in school in the first grade. When writing fast, sometimes there are indistinguishable string forms of letters и / п / н / л / к, у / ц, ш / т / м, с / е, г / ч.